Boatman Marking carries a large variety of foil stand up pouches that come in various sizes and colors to fit your packaging needs. Aluminum foil is one of the best barriers available in the flexible packaging industry that provides excellent oxygen, moisture, UV, and aroma protection for all products. Due to its exceptional barrier qualities, aluminum foil is being used in countless packaging applications including our stand up foil coffee pouches. The sizes for our foil stand up pouches range from 1 oz. to 5lb and along with a wide array of colors provides a broad spectrum of pouch choices. Sizes that come in 1 oz. and 2 oz. are available with or without zippers for sampling convenience, whereas the rest of the sizes all have zippers included for resealability. The Clear/Foil color option on each size gives you greater marketing opportunities and allows your customers to view your product prior to purchase. These particular stand up foil coffee pouches are 16oz in size and come with zipper and a degassing valve. The degassing valve was created to allow excess gases to escape without letting outside air substances back in. This prevents bags from expanding and eventually bursting due to gas build up. These valves are designed to keep your products fresh while also serving as a pressure relief system. Valves were mostly being used in the coffee industry but are now being used in expanding applications. The dimensions of these stand up pouches are 7" (W) x 4" (G) x 11.5" (H). 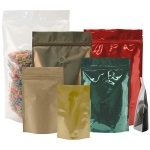 Get your foil stand up pouches and other packaging needs at Boatman Marking.